In our new Friday Faves series, we’ll be serving up some of the latest and greatest urbanism goodies to watch and read. Here are this weeks picks! Urbanized, the new documentary on the design of cities, from the director of Helvetica and Objectified, Gary Hustwit. Rare footage of Mumford on the City: Listen to the urbanism icon Lewis Mumford in the closing titles of this sereis of 27-minute documentaries produced by The National Film Board of Canada in 1963. 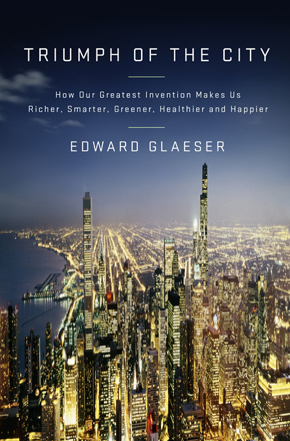 Urbanologist Edward Glaeser’s new book The Triumph of the City, in which he explain how cities around the world thrive and wither, and what makes them successful. The Social Life of Small Urban Spaces – The Street Corner: The 1979 documentary by William H. “Holly” Whyte, regarded as one of the most significan studies of urban planning. It was briefly online in its entirety less than a week ago, but was unfortantely taken down. However, you can still watch this snippet here. If you’d like to suggest your own picks, please do so in the comments below!